For someone raised in the desert Southwest, I have an inexplicably great affinity for Cajun cuisine. Though I’ve never been to Louisiana (or anywhere in the South except Jacksonville, Florida and a brief weekend in Oxford, Mississippi) I harbor rich fantasies about eating crispy beignets in the shade of a cypress tree while jazz music floats through the air. Admittedly, most of this probably stems from visits to New Orleans Square in Disneyland…so my dreams of Cajun culture may not be the most authentic. Still, I know there’s authenticity to my love of Cajun food. Case in point: recently, a new seafood restaurant opened in our neighborhood. I had no particular interest in trying it, but kept hearing rave reviews. Once my husband and I finally visited, I discovered it was a Cajun seafood restaurant, with some of the best Cajun catfish I’ve ever had. Now it’s our favorite spot for a lunch date. There’s something about the mix of spices with flaky breading and hot fish that is piquant perfection, if you ask me. Though Cajun food often centers around fish or meat fried in oil, it can also easily be made vegetarian, and it doesn’t have to be a grease-fest. Take these Cajun Chickpea Cakes. They pack the sublime flavor for which Cajun food is famous in a fiber-rich, lower-fat package. After tinkering with this recipe for years, I think it’s finally ready for prime time. 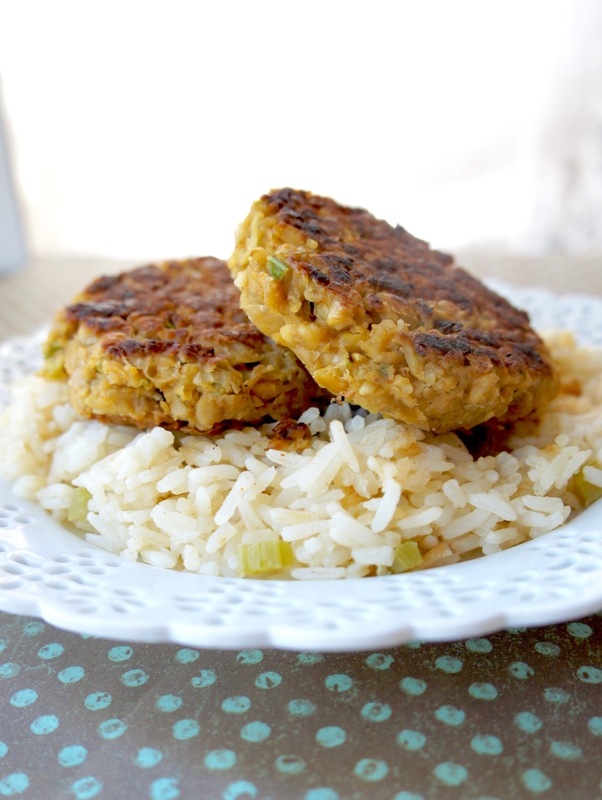 Served with dirty rice, these cakes are a unique, flavorful vegetarian meal! Not only are these Chickpea Cakes quite healthy as is, full of veggies and beans, they’re easily modified for dietary restrictions. Need a gluten-free meal? Sub cornstarch for the flour. Going vegan? Replace the egg with 1 Tablespoon flax seeds + 3 Tablespoons water. You can also feel free to experiment with the spices to achieve whatever level suits your taste. P.S. Fun trivia: did you know the word “Cajun” is a shortening of the term “Acadian”? Acadians were French immigrants who initially settled in Canada and the Northeastern U.S. (which is why Acadia National Park is in Maine) but eventually migrated south to Louisiana. Nice of them to bless American culture with their delicious food traditions! A unique vegetarian main dish with all the flavor you expect from Cajun cuisine! In a large nonstick skillet, heat 1 Tbsp. olive oil over medium heat. Add diced celery, onion, and green pepper and saute about 5 minutes or until tender. Remove from heat and reserve skillet. Meanwhile, in a large bowl, mash drained chickpeas until only some chunks remain (you don't want them super mushy). Add sautéed vegetables and all remaining ingredients. Mix until the mixture begin to hold together. Add more flour if necessary. Form mixture into 1/2 thick patties (should make about 8). Heat remaining 1 Tbsp. olive oil over medium/medium-high in the same nonstick skillet you used for the veggies. Add patties and cook about 3 minutes per side or until browned and crispy. Serve immediately (especially good with dirty rice)! I’ve already got a pot pie recipe on this site, and it’s kind of my pride and joy, since it’s one I came up with myself, and (can I brag a little?) it’s to die for. Savory chicken, a velvety cream sauce, and pan-roasted veggies….mmmm….it’s like my wee chickeny baby I just love to dote upon. But that doesn’t mean there aren’t other awesome pot pies out there, each with their own spin on the classic. My own recipe certainly isn’t the final word on pot pies, as far as I’m concerned. Especially when I see a new pot pie recipe that involves cheese. That’s right, I said POT PIE WITH CHEESE. If you’re a purist, you might think this sounds about as appealing as cheese on your breakfast cereal. (Aside: can I just note how long it took to think of something, anything, for that sentence that would be gross to put cheese on? But cereal and cheese does sound pretty wrong. Give me a minute, though–I may warm up to the idea…) When I saw this veggie pot pie skillet with cheddar biscuit topping over on Budget Bytes, I was smitten. If Beth, the author of that blog, tracks her visitor stats, she may have noticed a giant spike in the number of visits to that particular post in the last few weeks. They’re all me. I have now made this recipe four times since Christmas, with no signs of slowing down. Even my kids go crazy over this meal, which I normally would not think possible for something so obviously based on vegetables. The filling is herb-y and creamy and the biscuit topping always comes out light with just the right texture–a real feat for something as notoriously tough to nail as biscuits. All that being said, I do have to confess that while it may be vegetarian, this recipe is definitely not low calorie or low fat, since it has quite a lot of butter and no small amount of cheese. Still, we’re talking pot pie here, so nobody’s expecting it to be super healthy, right? In moderation, it’s a yummy, easy one-dish meal that won’t break the bank. Try it out for an alternative to the usual pot pie! A creamy veggie filling gets topped with tender cheddar biscuits in this vegetarian comfort food! In a 12-inch oven-safe skillet (very important that it's oven-safe! ), melt butter over medium heat. Add diced onion and saute until transparent, about 5 minutes. Add flour and continue to saute another minute. Pour in milk and vegetable broth and whisk until smooth. Add salt, thyme, sage, and some black pepper. Bring the mixture to a boil and let simmer for a couple of minutes until it thickens to to the point where a utensil dragged through it leaves a trail. Add frozen vegetables and stir to combine. Continue to cook until veggies are heated through. Preheat the oven to 425 degrees while you make the biscuits. In a large bowl, combine flour, baking powder, and salt. Cut in cold butter in small pieces and mix with your hands, the back of a fork, or a pastry cutter until the mixture looks like damp sand. Add cheddar and chives, then milk. Stir just until a dough comes together. Take the veggie filling off the heat and dollop the biscuit mixture evenly across the top of it. Somewhat adapted from Budget Bytes. Bring it back! Bring it back! The fact is, unlike the processed mystery that is 1-2-3 Jell-O, I’m new to the crunchy crimson veggie wonder that is red peppers. Up until the last couple of years, I ate red peppers only under social pressure, and even then would prod them around my plate like a picky toddler. I had the sneaking suspicion that people who claimed to enjoy bell peppers were trying to play a vile joke on the rest of us. But somehow–probably as a result of learning in my nutrition studies how fantastically healthy peppers are for you–I have gradually come around. It’s amazing how our mentality can change our feelings about food, isn’t it? (I draw the line, however, at mushrooms. Mushrooms are an eternal abomination.) Having developed a taste for red peppers, though, I’m now all over the map trying them in various combinations and permutations. It was inevitable, then, that stuffed peppers would make their way into our family’s meal rotation. This version of the classic is 100% vegetarian with a hefty dose of black beans, rice, corn, and tomatoes and a not-too-spicy Mexican flair. 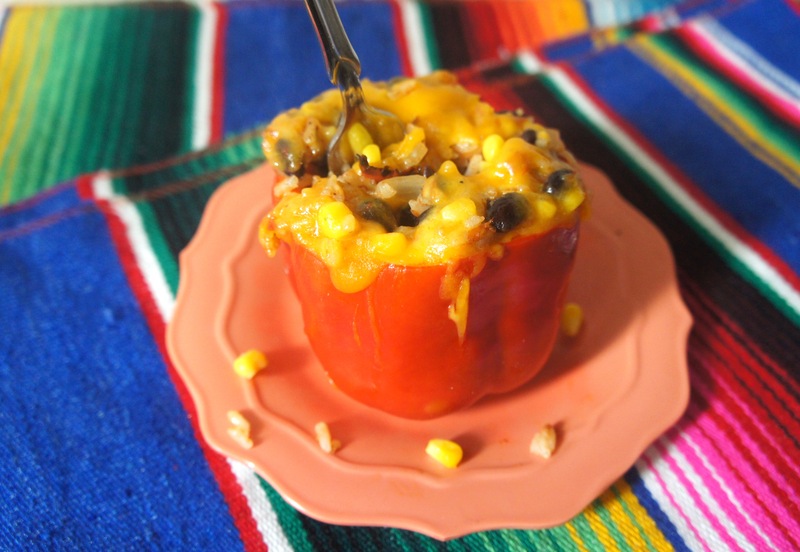 The rice and bean filling is delicious all on its own, but stuffing it in a tangy red pepper dripping with sharp cheddar takes it over the top. 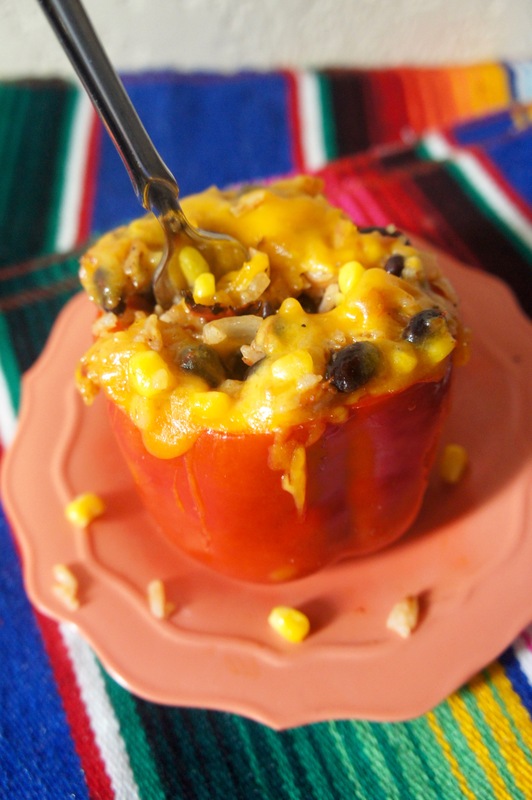 My husband–a more experienced stuffed pepper eater–says that most stuffed peppers have a softer texture than this recipe, but I for one enjoyed the not-too-squishy crunch that these peppers retained by not baking for too long. These made for a satisfying vegetarian dinner I know I’ll make again. So how about you? 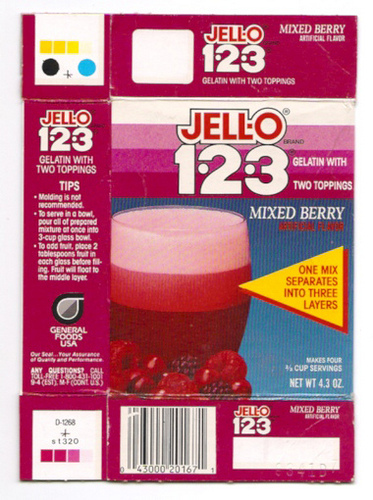 Do you have a current food obsession, or a food you used to hate but have come to love? Tell me all about it! 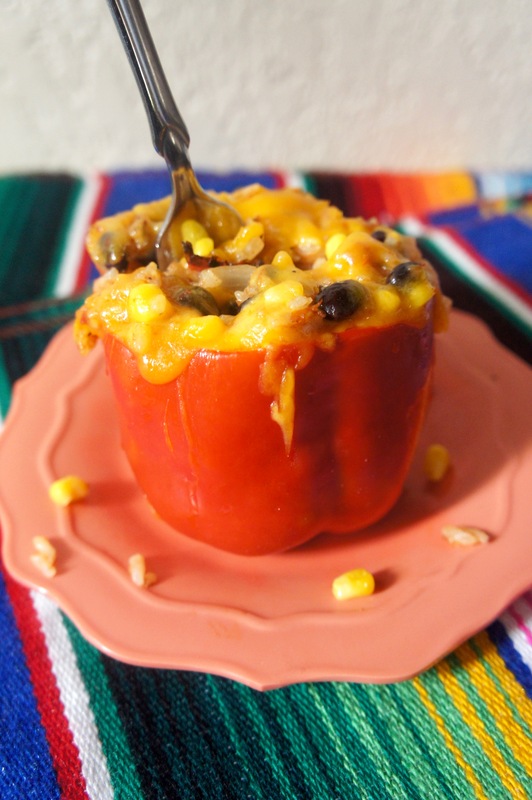 A healthy vegetarian stuffed peppers recipe with a Mexican flair! In a large saucepan, heat olive oil over medium heat. Add onion and saute 5 minutes, then add minced garlic and saute another 30 seconds. Add rice, vegetable broth or water, diced tomatoes, salt, pepper, chili powder, cumin, and oregano and bring to a boil. Reduce heat to low and simmer 16-18 minutes or until liquid is absorbed. Meanwhile, preheat oven to 350 degrees. Slice off the tops of the peppers and scrape out the seeds and membranes. Place peppers snugly in the bottom of an 8 x 8 glass baking dish (or larger, depending on the size of your peppers). When rice is finished cooking, add corn and beans to the mixture and stir to combine. Spoon carefully into peppers. Cover tightly with aluminum foil and bake 20 minutes. Remove foil, sprinkle with cheddar, and continue baking another 15 minutes. Serve immediately. At any rate, this soup is a whole food recipe you can feel good about in the midst of this season of indulgence. Make it a meal by serving with a side of crusty bread. 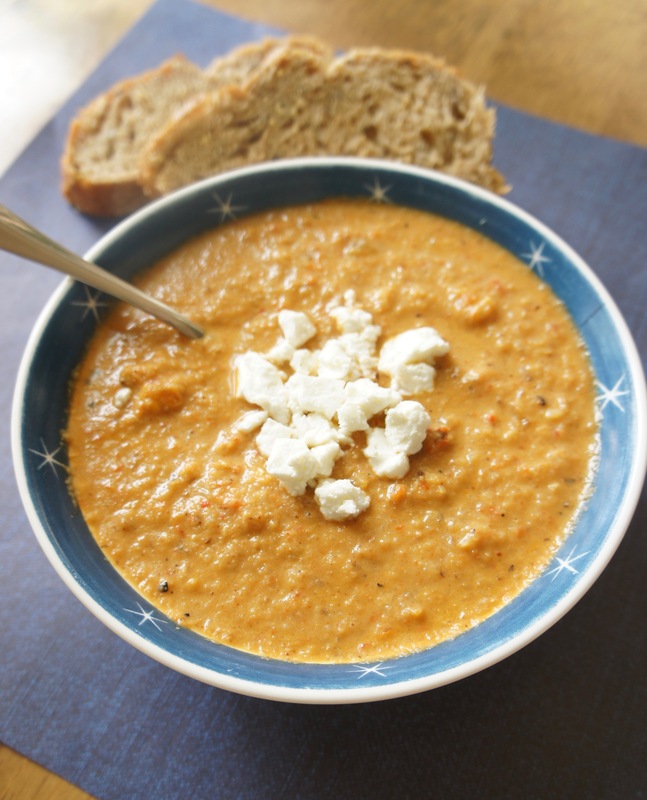 And when you taste the mix of roasted red pepper, cauliflower, onion, garlic, spices, and goat cheese, you’ll understand what I mean about acknowledging every ingredient. Feel free to shout from your rooftop! 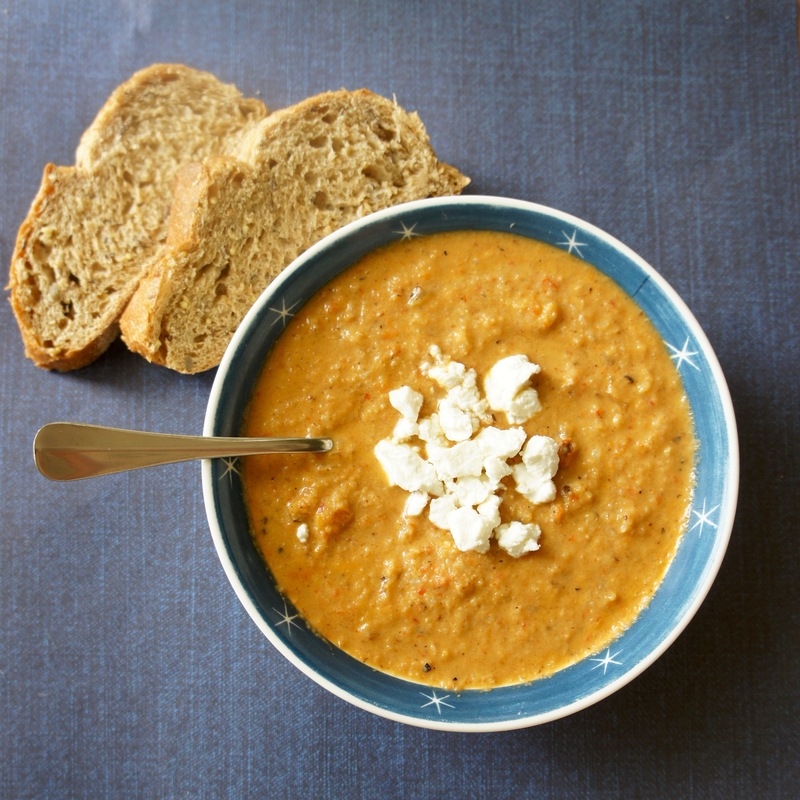 This vegetarian soup is both healthy and hearty! Heat broiler to high and place red peppers, cut side down, on a baking sheet about 4 inches from the broiler. Broil until skins are mostly blackened, checking frequently, about 5-7 minutes. Place in a sealed container and let steam for 20 minutes. Peel off skins and dice peppers. Meanwhile, heat oven to 400 degrees. Toss cauliflower in 1 Tbsp. olive oil and spread evenly on a baking sheet. Roast 20-30 minutes, stirring once halfway through. Heat the other 1 Tbsp. in a stock pot over medium heat and saute the onion until tender, about 5-7 minutes. Add the garlic, thyme, and red pepper flakes and cook about 1 minute. Add diced red peppers, roasted cauliflower, broth, paprika, and goat cheese and simmer 10 minutes. Puree to desired consistency with an immersion blender, stir in lemon juice, season with salt and pepper, and serve.